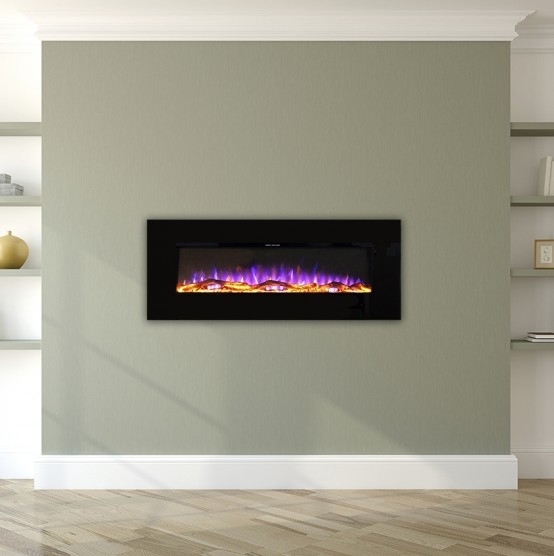 The Ultiflame VR Decadence is a hearth mounted inset electric fire that uses innovative technology to create a Virtual flame - Real fire experience through 3-Dimensional visual depth, wide angle viewing and realistic flame movements. The deep fuel bed has supremely detailed ceramics that capture the authentic shape and texture of natural logs, placed over a perception of hot crystal embers. At the touch of a button, Ultiflame VR Electric Fires will stimulate your senses with a captivating visual flame display, whilst enjoying and relaxing in the comfortable warmth of a Virtual-Reality open fire experience. This fire comes complete with a beautifully designed cast-iron fascia and is available in Gold, Silver, and Black nickel finish, making the Ultiflame VR Decadence the perfect choice for modern homes with stylish interiors.